Plasmonic lab-on-a-chip; nanowire sensors; robots with sandals. For some time, lab-on-a-chip (LOC) systems have generated interest in the medical field. LOC systems provide analysis of biomolecules for use in basic biology research, disease marker identification and pharmaceutical drug screening. In one effort, Boston University, the California Institute of Technology, EPFL, Pontificia Universidad Catolica del Peru and UCLA have devised an optical LOC system. In a point-of-care system, the optical LOC could quickly analyze up to 170,000 different molecules in a blood sample. It could also identify insulin levels, cancer markers, Alzheimer markers and certain viruses. 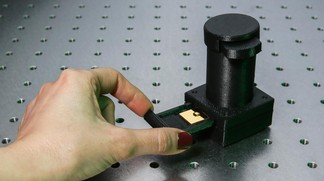 The system provides on-chip imaging. This, in turn, dispenses the need to use expensive spectrometers. All told, researchers demonstrate label-free and quantitative detection of biomolecules with a protein layer thickness down to 3nm. The portable point-of-care unit is about the size of a stapler. The lab-on-a-chip biosensing device weighs 60 grams and is 7.5 cm tall. The system combines wide-field plasmonic arrays, a lens-free computational on-chip imaging unit and a light-emitting diode (LED). The plasmonic chip consists of microarray pixels. It is composed of periodic nanoholes fabricated on a thin gold film. This, in turn, will enable the device to detect the variations in the surface conditions due to the specific binding of molecules on the chip surface. More specifically, the plasmonic device consists of a 10- x 10mm gold plate pierced with arrays of small holes less than 200nm wide. Nanoholes on the gold substrate are compartmentalized into arrays of different sections. Each section functions as an independent sensor. The University of Twente and University of Tsukuba have devised two types of nanosensor platforms for LOC applications. The first one involves an integrated platform based on silicon nanowire (Si-NW) sensors. The second platform is based on nanostructured metal surfaces with defined nanogaps and tunable plasmon resonances. In the first platform, researchers devised an integrated Si-NW biosensor system. It consists of an automated, multi-sample delivery module, which can deliver precise sample volumes to the integrated microfluidic analysis cartridge using regulated pressure sources. Researchers demonstrated real-time duplex hybridization measurements of complementary DNA target molecules to peptide nucleic acid (PNA) probe molecules. The measurements have been performed with sample flow speeds high enough to ensure reaction-limited transport of the target DNA to the sensor surface. The key to the unit is a Si-NW field effect transistor sensor. Electrical biosensors such as Si-NWs can be integrated with conventional electronic readouts. Si-NW field effect sensors have many different applications, such as chemical and pH sensing, gas sensing and others. Si-NW field effect transistor sensors can estimate surface potential changes of a solution/gate-oxide. This is done by measuring the conductance change of a multi-gate nanoscale silicon layer in direct contact with the gate-oxide layer, according to researchers. In a system, researchers devised triangular Si-NWs. They were fabricated by conventional microlithography, wet anisotropic etching, oxidation etching, and dry etching. All devices are boron doped at 100nm heights. “The pH sensing behavior of the Si-NW sensors have been evaluated with thin surface layers of Al2O3 deposited using atomic layer deposition on oxidized Si-NW sensors,” according to researchers. The robotics field is still in its infancy. Today’s robots are limited to simple tasks in controlled environments. And many breakthroughs are required in the arena. In one possible breakthrough, the Riken BSI–Toyota Collaboration Center has devised a way to improve the walking skill of a two-legged robot. This is done by programming the robot to adapt its posture in response to cues from the environment. Researchers developed a “tacit learning” scheme. This enables the robot to tune primitive and reflexive actions into more complex functions. Researchers devised a computer model, which simulated the natural process based on interacting code structures. In doing so, researchers hoped to control 36 movable joints in the robot. In the first trial, the robot fell down, according to researchers. But after around 10 minutes, the motion was sufficiently tuned to keep the robot walking at over 7 centimeters per second.